Where to begin with so many firsts? With so many ‘firsts’ to relate – I’m not entirely sure where to begin. I feel I should probably begin with an apology (certainly not my first and definitely not my last!). In last week’s post, I said my next entry would focus on taking an oil painting, doing a preparatory tonal sketch then putting aside the source image and painting from the sketch. And I promise I will do this – but just not for this week! Instead, events overtook me a little and I was presented with an opportunity to do my first plein air painting of the year so this alone was a big event in my painting calendar. In anticipation of this most auspicious occasion, I had for been preparing for some months: what will I need, how much will I need, what can I leave behind, how am I going to carry everything etc. So another first for this day was my whole easel set up. One of my past challenges has been how to travel lightly and transport paper, board, paints, tripod etc but, after much agonising, a modicum of preparation, and a small dose of DIY, I think I may have cracked it! I recently made myself a new drawing board inside which I’m also able to store about ten sheets of quarter imperial paper. On the rear of the board is a Ken Bromley Camera Mount that allows the board to be attached to a camera tripod. The board in these photos is shown in portrait position but, on the left hand side of the board you can just make out a handle for carrying and, on the opposite side, there’s a hook to a hang a water container on. Purely by coincidence, this drawing board is also the same size as another bit of 6mm board that I’d made previously that I can attach to my easel with a couple of bulldog clips to provide me with a handy shelf. This is so I can have brushes, tissues, more water etc to hand, plus a place to rest my palette when I need a break or to step away from my painting. I’d spotted this scene on a recent day out and earmarked it as an ideal subject. It’s very much in the Seago ilk, plus it’s delightfully remote as right behind this viewpoint is a steep bank leading up to a busy road. Aside from the odd dog walker, jogger and horse-rider, I was completely alone and didn’t have to contend with anyone looking over my shoulder – which I’m just not ready for yet! I was able to park a short distance away and try out carrying my kit and I’m delighted to say it was all light and easy to carry. I was little disappointed that the weather was so depressingly grey which made the landscape look very flat, but I was determined to make the best of it! A grey old day indeed! I got myself all set up, and spent a good few minutes moving the easel around, trying to identify the best spot, and here’s when yet another of my ‘firsts’ occurred. Some time ago, I think when I ordered the camera mount from Ken Bromley, I also ordered a ‘view catcher’ that is supposed to help you identify or frame a scene. I’d yet to have occasion to use this and, to be honest, I was quite sceptical – but no more. Without the view catcher, I was trying to include far too much of the view than was possible. Using the view finder and slightly adjusting the distance I viewed it from, and taking a few steps to each side, I found it really helpful in pinning down exactly what I wanted to paint. It also helped me mentally compose the picture before even putting pencil to paper. Now by this stage, I’d already decided that this was heading towards being a disaster and that I’d just use it as a quick loosening up exercise, after which I’d do another, proper version. By now however, I was also totally consumed by what I was doing and didn’t really manage to take any more ‘in progress’ photos. I felt I was fighting tooth and claw to save this painting, putting one wash over another in ever more desperate attempts to portray what my eyes could see. I was unexpectedly struck by just how much I talk to myself too. I was providing myself with a constant commentary, encouraging at times, chiding at others, blaspheming all too frequently. I felt completely powerless to stop myself gabbling away and decided that for this reason alone, I’d probably never be able to paint in a more populated setting. This continued right up until I decided to call a halt to the whole debacle. I much prefer looking at this from a safe distance rather than this close up! Now the funny thing is, I distinctly remember saying in a recent post that one of the bits of advice that I cherish most is not to compare any of my efforts with their source – whether that’s directly from nature or from someone else’s painting. Well. I’d like to make my first exception to this rule of thumb! My favourite image from this painting expedition is where I can see the painting in-situ and in the context of the landscape and prevailing light conditions. On it’s own and close up, I think this painting looks a little dirty and heavy handed (most likely because it undoubtedly is both of these things!). Shown from a distance against however, and in the landscape that inspired it – I’m a little more please with the results and excited about doing many more paintings on location. I think that this image also clearly demonstrates the benefit of using the view catcher too. I wasn’t intending to create such a precise window onto this view so I was really amused when I saw how closely the distant hills, stream and river banks etc matched up. So, all in all, this was a really pleasing first effort of the year, and a good test of my kit. It was great to be painting outdoors and wrestling with all the challenges that it presents. I also feel that the work I’ve been putting in recently, emulating the likes of Seago and Wesson and becoming more and more familiar with my palette, brushes and how to wield the two together – is really beginning to pay off. Now if only I could stop my constant jabbering! I like your plein-air set-up and especially your drawing board, which I think is brilliant! 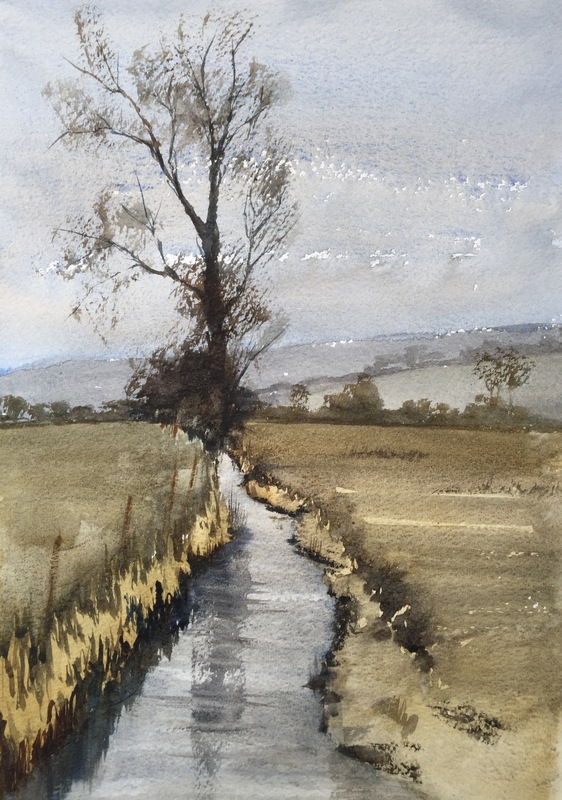 The fact that the watercolour looks OK, when viewed from a distance, shows that the colours and tonal values are right. So the only problem is with the over-working, which is not surprising on a first outing. Painting outdoors is so different that it takes a bit of time to get used to it. Given that the result was not bad, and the equipment all worked well, I think you should feel very encouraged. Hi Keith and many thanks for this. I must confess that I’m really pleased with how well the ‘set up’ worked and especially the board come paper carrier – maybe I should commercialise it! I think you’re right about the over working. It took me too many washes of varying degrees of opacity before I hit the right tonal values – rather than cutting straight to the chase with a single wash. 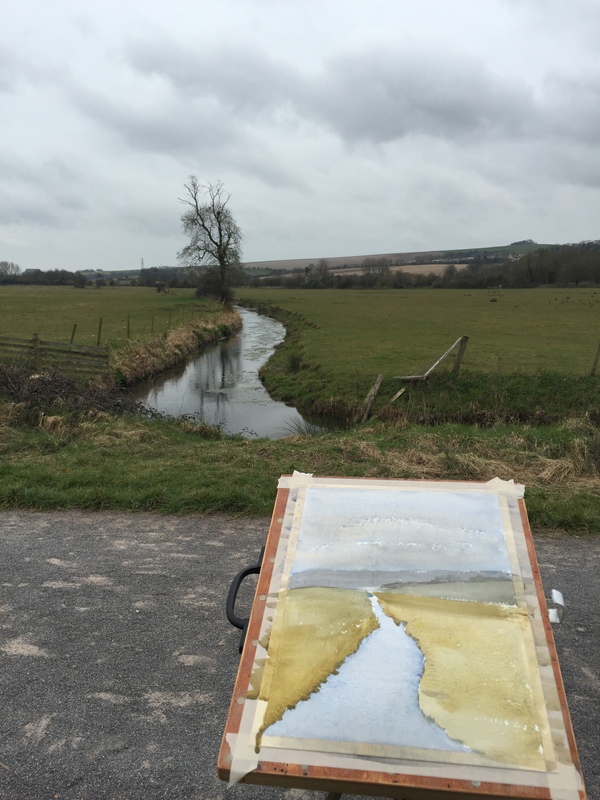 It was great to be painting outdoors though and I was also able to get quite a few good reference photos so I think I’ll be trying another ‘studio’ based version of a similar view/composition. This is a great painting. Love the roughness of it and your in-situ photo is amazing. Thanks for listing the details of setting up. I’ve only done a few plein-air sketches in my moleskin. Haven’t the first clue about how to set up for a larger project. Enjoyed the process and lovely results. Thanks so much for this – hopefully I’ll be able to do more in location paintings like this and get better at both painting them and documenting them! It’s such different set of challenges painting outdoors but it’s also completely thrilling and engrossing! I think that your painting turned out beautiful. I noticed your comment that you were afraid that you were botching it (my paraphrasing) in the initial stages but isn’t that usually how it feels and sometimes not the case? How do you deal with that “oh no, I am ruining it!” stage? Though I find out sometimes as I relax that it isn’t botched, it is just fear! Anyway, I enjoy your posts so much and it helps me because I struggle with so much that you struggle with. I also wondered if I would use my view catcher and now I love it and use it religiously. Interesting that I also like a painting when viewed at a distance, I get really nit picky when I view my paintings close-up. what lets most painters down (at my level at least) is not necessarily a lack of ability but a lack of belief. You have to believe that it’s all going to work out fine, otherwise you’ve already lost the battle. I think your work is tremendous so there’s no reason for either of us not to believe that it’s going to work out okay. I think we should both try to carry and apply this belief with us in our next efforts! Very nice. Thank you for posting your initial steps. What a nice setup you have. I have one of those view finders. It helps me with perspective if I am looking at a building. Thanks Carmel – I was surprised at how helpful the viewfinder was. The one I used only creates a window to the proportion of different paper sizes but I’ve seen some that also have perspective lines on them too – do you use one of these ones? John, I have the same viewfinder as you. Even though I basically know perspective the hand will sometimes go in a different direction! Looking through the viewfinder enables me to check the angle of the lines of the building. I did not know that actually made one for perspective! Thanks Carmel – I know what mean about the hand sometimes going in a different direction! I’m sure I’ve seen a viewfinder with perspective lines running into a vanishing point that’s specifically designed to help with street scenes etc. Thanks so much Carolina – I really appreciate you taking the time to comment and I take a great deal of comfort and encouragement from knowing that I’m not alone with my artistic frustrations, failures and successes! You are very welcome John that’s why it is so great to be able to interact with other artists and share experiences! Clever! Thank you for sharing the process. I like your painting or end result lined up and matching with the real scene. Thanks Susan – as I say, the matching up with the landscape was much more luck than judgement. I’m already curious to see what happens when I try out the view catcher again to see if something similar occurs. Haha – thanks Jodi – must confess that the jabbering came as a complete surprise!